We had the pleasure of taking part as partner of FQAS. 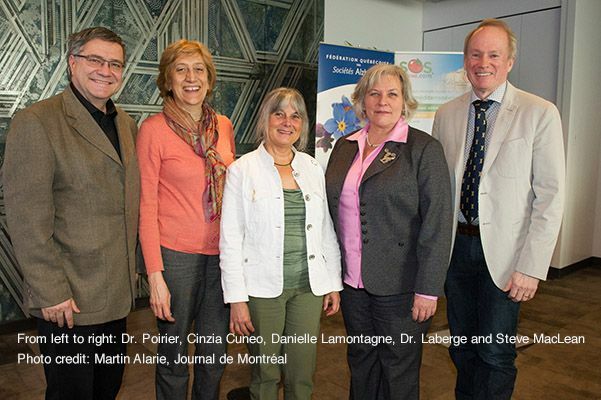 The event, which took place at the Institut de Tourisme et d’Hôtellerie du Québec (ITHQ) was entitled “L’expérience gastronomique: une exploration dans la nutrition pour prévenir l’Alzheimer” (“Gastronomy: an exploration in nutrition for Alzheimer’s prevention”). Guests listened to a panel on nutrition and lifestyle, and how these relate to cognitive health. 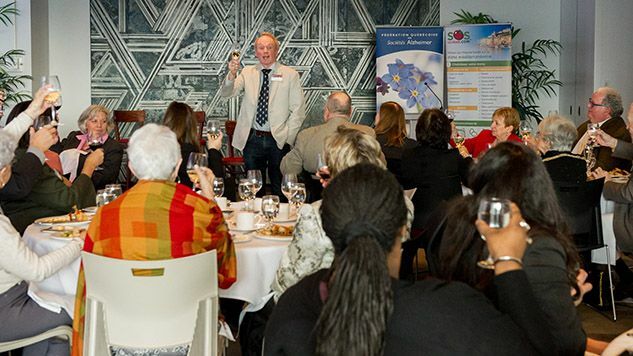 Expert guests included Dr. Judes Poirier, Director, Molecular Neurobiology Unit, and Assistant Director of the Centre for Alzheimer’s Prevention at the Douglas Institute, and Danielle Lamontagne, R.D, Director of the Nutrition team at SOSCuisine. Dr. Christiane Laberge hosted the panel, which engendered interesting discussions, to answer the audience’s many questions. The event ended with a 3-course meal inspired by recipes from our book (in French) “Mieux manger pour prévenir l’Alzheimer et d’autres maladies neurodégénératives” (Eating Better to Prevent Alzheimer’s and Other Neurodegenerative Diseases), showing that you can treat yourself while taking care of your health. A toast by the astronaut Steve MacLean, ambassador of FQAS. 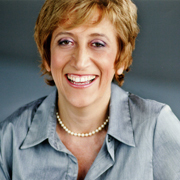 Photo credit: Martin Alarie, Journal de Montréal. I’d like to thank FQAS for their flawless organization, the ITHC for promoting our recipes, our publisher, Les Éditions du Journal, and Les Viandes De La Ferme for sponsoring the event. In the following table you’ll find a summary of our top recommendations to eat well. If you want to easily give them a try, subscribe to our Alzheimer’s menus! « The Super Bowl: Altar of Sporting Events or Just A Cheat Day?